I think the XS Max is amazing, a bit of extra size was the only thing that the original X needed. Why do Americans insist on ignoring the 'i' when they pronounce the word mobile? Also at the 1 minute mark, what is 'Porsche' mode? The "I" is pronounced, just differently. The word "ill" is an example of the pronunciation. At the 1:00 mark, he says "portrait," not Porsche. 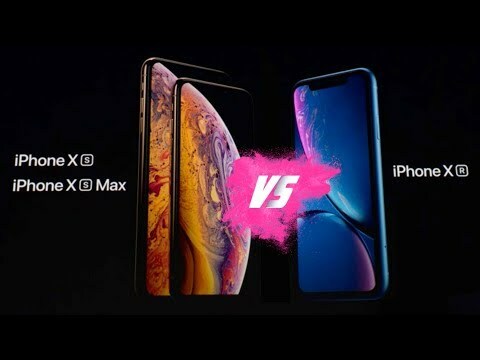 I'll be buying the XS Max, but I'm not sure which color I want. I have the "silver" X now. I may go for the space gray this time. Why do Americans insist on ignoring the 'i' when they pronounce the word mobile? Are you asking why words have different pronunciations in different cultures? For current 6/6s/7/8 Plus series owners it's very reassuring to note that the iPhone Xs Max is nearly identical in overall dimensions to the Plus phones. The Max is 0.27 oz heavier than a 6 Plus but all other dimensions are virtually identical. If you are comfortable pocketing your current Plus phone the Max will not put any additional strain on your pocket. Your pocketbook on the other hand ... ouch. XR's lack of HDR support for the screen is mentioned, but I'm surprised that it's not linked more closely with the camera function. You can shoot Smart HDR content on the XR, but you're not going to be able to see the full benefit of that on the phone itself, which in turn is going to limit how well you could edit Smart HDR content on the phone itself. I have the 7+ which is by far the best iPhone I’ve ever owned. The Max looks like a pretty awesome phone, the name is kinda cheesy though. I generally upgrade every two years but decided earlier in the year I didn’t see the value (plus I’d have to upgrade the wife’s phone too). I’m really annoyed that the $1,100 Max only comes with 64GB. So I’m looking at $1,250 for a Max with 256GB. I have a 128GB now and probably use 40-45% of that. Will hold out until next year to see if they will up the storage, plus I’d like to see more camera improvements before upgrading. At $1,250, I’ll have to consider keeping the phone 4 years to get my value out of it. had previous battery replacement and current does not make the day. Yes, OUCH on the price. The XR looks like the device I might consider (seriously), having almost every bit of the "good stuff" without the 1K-plus price. I'm not seeing another $250 of value in the next model up and certainly not $350 to go further up the scale. $750 for the XR is a very fair price IMHO. So I might surprise you. Not sure yet. As I said in another post, there are certainly upgrades from the Xr to the Xs - higher resolution OLED screen, better camera, 4 vs 3 GB processor RAM, & slightly better water resistance, but for many people, those won't matter enough to justify the additional $250 and the Xr will be a great value for them. I'm really curious to see direct comparisons between them once they come out. Came to read comments about new phones, wound up reading inane comments about word pronunciations. C'mon kids, try to stay on topic. I typically update every year and I was on the iPhone Update Program but I paid off my last payment a few weeks ago and I still have no strong interest to update my iPhone 7 Plus so it’s likely i’ll keep it for a 3rd year. It’s not because of their cost or the tech, but because the Watch plays a more important role in my life. I’ll be replacing my Series 3 with a Series 4. Now, if Apple split HW category updates across different seasons of the year I would probably go back to updating everything annually just to get that new CE rush. Ditto, just ordered Xs Max 256 GB. Last year was iPad Pro 10.5 512 GB. Still have 275 GB free. I've been pocketing a 6 Plus since it first arrived. For whatever reason, the size has never bothered me in the least. If I'm wearing blue jeans I may remove it from my front pocket when I'm driving my manual transmission vehicle, but even then it's not mandatory and I mostly do this because it's more readily available and I can recharge it. With the Apple leather case I find the 6 Plus more comfortable in my pocket than my old 4s because the 4s had sharper edges. If you really think the Xs Max or Plus sized phones are too big you should try one for a while. There is an acclimation period, just like when you got your first really big HDTV. But after a short period of time it doesn't seem so big and you're looking for even more. Going from a 6 Plus to an Xs max you're actually getting a lot more screen real estate, significantly better resolution, and greater brightness, while the physical size is the same. It's amazing to get more of what really counts and not have to settle for a physically larger phone. The Xs Max nails it for people who are upgrading from a Plus model. My only disappointment with this upgrade is that I have to visit the AT&T Store to move my spouse's phone account from a 4s to my old 6 Plus (which is actually less than 2 months old). I was hoping to swap SIM cards myself, but no such luck, Micro to nano doesn't work. Visiting the AT&T Store is always friggen torture. The lack of water protection with the 6 series and older phones has always been a concern. So far none of my phones have ever felt a drop of water, but mostly because I am cautious about taking them out if I may be caught in a deluge or I'm on the water. Having a phone with IP68 certification is a very big deal for me. Disappointed they got rid of the 128g as I barely use 109g on my X but I ordered the 256g Xs Max (I really HATE that name). Next Friday can’t get here quick enough. Anyone know if preordered phones ever get delivered before the launch date?